I had a brilliant time with my girl friends last night at a fundraising event at the church hall. We went last year and had much hilarity and this year was even better. It was a race night during which races are shown on a big screen, bets placed and much Prosecco consumed. We had pie and peas for supper too which was absolutely delicious. It had been lovely and sunny all day and remembering how warm last year’s event was, I opted for a lightweight floral top with jeans and wedge sandals. The heart pendant is new to my boutique. The silver heart pendants have proved to be very popular so I was keen to get something similar in gold. This design has a taupe leather chord and the heart itself is in a rose gold tone. I absolutely love it. 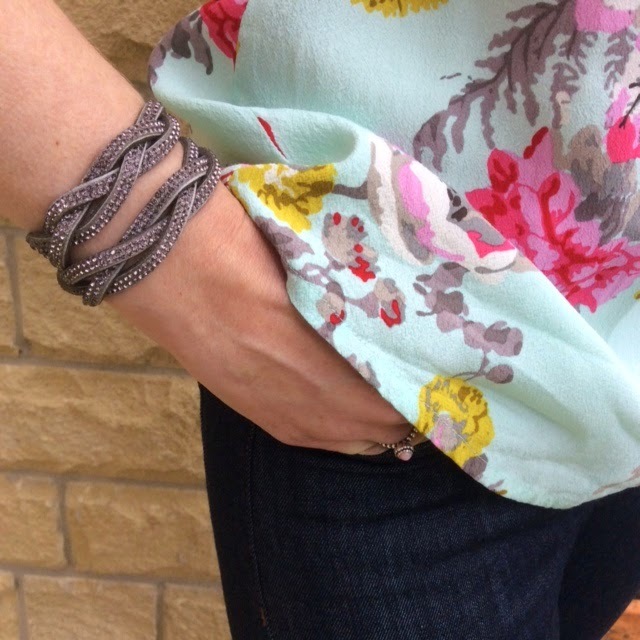 The plaited double-wrap bracelet is also new to my boutique. Again, it’s a taupe colour with diamante detail. It’s subtle enough for day wear but has enough sparkle to shine in the evening. I styled this top differently last spring with yellow heels and high waisted jeans.